For the ultimate driving adventure, look to the packages offered with BMW European Delivery, which takes visitors to the BMW Welt to meet their new car! BMW has always gone above and beyond when it comes to standards of quality with its ability to bring a unique experience behind your drive. One experience like no other is the European Delivery. Simply put, the European Delivery is a unique experience in which a buyer has the opportunity receive their BMW from the source. European Delivery offers customers the chance to adventure Europe in their newly received and specifically tailored BMW model. Via Corsa was able to follow a few owners that embarked on this journey, as well as some BMW fans gathering for the BMW Centennial Tour. We are happy to share their stories with some anecdotes from their experiences. Via Corsa: Why European Delivery? Russell Rodriguez (Centennial M Tour): Are you kidding me? !…I am pinching myself. BMW Welt delivery…3 formula 1 tracks…the Alps…need I say more? Karl Hudson: Well, this was a very special purchase. It was my first BMW, but also my birthday. I also realized that I would never be able to push my car to the top of its limit like I could over in Europe. Paul Silver: European Delivery, in general, provides a fun, memorable vacation. Driving around and seeing the sights in a new car that you get to keep as a souvenir is pretty. 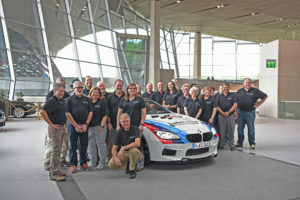 Via Corsa was lucky enough to run into the group celebrating the BMW Centennial Tour and follow along on their European Delivery experience. Via Corsa: What was the single most exciting time driving your BMW? Blaine McNutt (Centennial M Tour): This goes hand-in-hand with the most exciting destination…the Nürburgring. Lisa Goehring (Centennial M Tour): Our track day at Spa Francorchamps. Via Corsa: What was the single most exciting destination? Greg Uhler (Centennial M Tour): My wife and I really enjoyed the day we went to the Italian Dolomites. A friend described it as the best roads in the world set in a location like Yosemite Valley. Kurt Helm (Centennial M Tour): I would have to say that delivery day at the Welt. We;ve all seen the videos and photos of the process, but it becomes very real as you walk down the stairway to see your new car for the first time. Next articleVia Corsa & AutoWerkz TV bring you the Mille Miglia! Picked up my Mercedes-Benz SLK250 near Stuttgart. While the MB delivery center is not as palatial as the BMW Welt in Munich, the experience and kind attention of the staff is wonderful. I encourage anyone to take advantage of these programs.